2013 has only just begun, but since the calendar changed, I've completed a couple of big deal goals (big deal for me, that is). I was planning to have both of these done by the end of 2012, but since I didn't, they are just making 2013 look extra good. 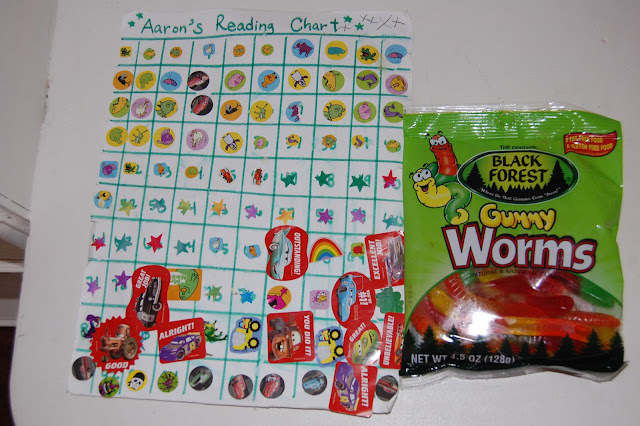 Aaron was so excited to put the very last sticker on his bruised and battered chart. Then I told him he could pick out a treat for finishing such a big project. He chose a package of gummy worms (this kid sure knows how to dream big!). Now Maxwell thinks it's his turn, but I think we'll give him a few more months! My second big accomplishment is that I finished reading the Old Testament. It only took me three years (said with a touch of bitterness). THREE YEARS! I am reveling in being finished. This was not an easy goal for me to accomplish (hence, the three years). 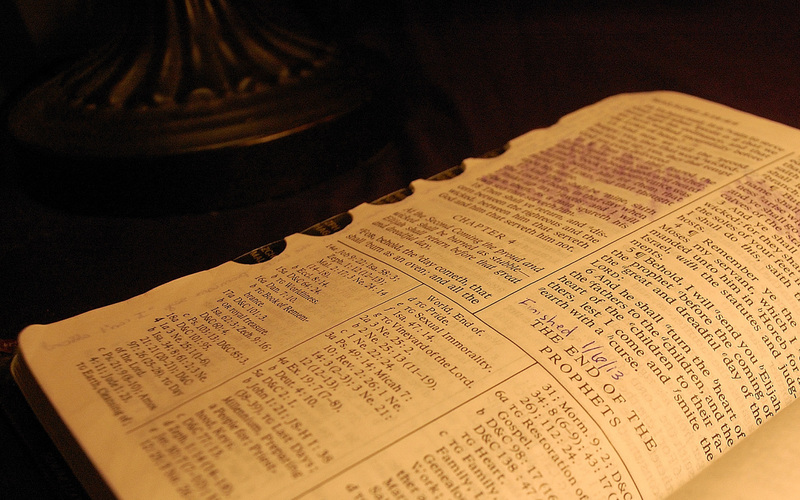 I love reading the scriptures, but...I can't say I loved reading the Old Testament. I loved many parts of it, but there were times when it was so confusing, or even just mundane, and I would think, Why am I torturing myself? I wanted to know what the Old Testament was like from start to finish. When it is the course of study at church, it is whittled down so that the entire book can be covered in a year. I wanted to see what was being skipped over (answer: long genealogical lists and temple dimensions/materials). I wanted to find the hidden gems that get lost among the well-remembered and loved Daniels and Jonahs and Esthers. I wanted to have my testimony of the Savior in His role as Jehovah strengthened. And, perhaps the least important but definitely a part of my decision, I wanted to be able to say I read the entire Old Testament (and so, I made sure to read every word, even in Chronicles where there were pages and pages of "the son of Ethni, the son of Zerah," etc.). Many of my frustrations came from reading slowly and meticulously and re-reading certain sections but then, upon closing the book for the day, not having the faintest idea what I had read about. Maybe I should have read some sort of study guide or commentary along with it. I most enjoyed reading when I kept a study journal at the same time. After reading for the day, I would choose just one sentence or phrase that had stood out to me and think and ponder and write about it. Sadly, I misplaced my journal somewhere around Psalms and didn't replace it. And that was probably a big mistake. And speaking of gems, I did find some. They are definitely there. My very, very favorite story and the one that I have thought about multiple times over the last year, was about King Hezekiah, who happened to be an extremely righteous king nestled right between some extremely wicked ones. At one point in his life, he is quite ill, and Isaiah the prophet tells him he is going to die. Hezekiah weeps with the news, begging the Lord to remember his righteousness. And then, miraculously, the Lord sends Isaiah back to tell Hezekiah that he will be healed (2 Kings 20). I have thought about this story again and again whenever I finding myself doubting whether my prayers matter. I've thought a lot about whether I will ever read again the Old Testament in its entirety. I would hate to say "never" because that sounds so definitive, and who knows what the future will bring, but I think I can safely say that most likely no, I will not read the entire book ever again. I will study sections of it, no question, but I think once through entire genealogical records is enough for one lifetime. My life has been richly blessed by these two goals, and I am addicted to this feeling of accomplishment. Time to set my sights high and reach for great things! Congratulations to both you and Aaron on your reading accomplishments! You go girl. What a beautiful picture btw. Congratulations! I once contemplated making a goal to read the entire standard works in a year, but decided against it. Instead I'm reading the BoM and one other book each year. Last year it was the NT, this year is D&C, and next up is the OT. I'm dreading and looking forward to it at the same time. Santa brought my son gummy worms. He made them last for several weeks. I think it's amazing that you finished the Old Testament! I've only read the Book of Mormon all the way through several times. I definitely would like to be more familiar with the Bible, though. You're inspiring me to do better! I am very impressed that you read the entire Old Testament. I have started that goal many times but have never followed through. And I love the Teach Your Child To Read book. It's how I taught Seth too, but I think we've already talked about that. I had a harder time finding books to bridge the gap for Seth from that book to real books, but it might have just been our library :) I bought some on scholastic.com that worked really well. I have tried to start Ezra on that book, but he's not ready yet so I have to keep waiting. Sigh. Way to go! For Aaron--we do the Bob Books, but they'd be largely review for him at this point (but there ain't nothin' wrong with that, necessarily!). I brought home a bunch of old-school phonics readers from the lib the other day, and we also like the good ole' "beginner books" (a la Dr. Suess, P.D. Eastman, and co.).